Boil carrot,beans, peas & strain water .Mix all boiled begetables,mashed potato,paneer, mushroom,plain flour,corn flour,cooked rice & salt to mash well . Make a small size ball, to fry until golden brown. Heat oil in a Oak. add chopped onion,garlic, ginger& pepper to saute few minutes. Add soya sauce,tomato sauce,chilli sauce to saute few seconds & add fried vegetable balls. Mix gently & finish with spring onion & cilantro.Serve hot. hey adding rice and paneer is something new. the picture looks yummy. I'm always for manchurians.. looks delicious. this is something new to me.. never heard of veg manchurian.. i have only had cauliflower manchurian. great post srikar! 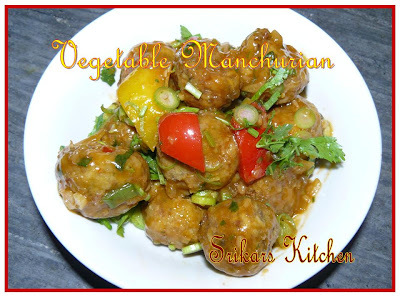 I could eat a plate of veg manchurian any time, yours look perfect. This is my kind of food. When will you invite me over for lunch? Adding mushrooms is something new to me. Looks awesome. Hi, the dish looks perfect. I have never tried chinese at home. Have bookmarked the recipe. Manchurian looks perfect.. adding rice and paneer is something new to me. So many chopped veggies intimidate me sometimes, but It's so worth it to make a dish like this!